Copyright © with a smile from Michael Alan Ross, 1999-2015.
came together in the thoughts of the Jewish lawyer whose Boston residences stand today at 114 Mt. Vernon Street and 6 Otis Place. World famous and outspoken on Jewish issues, Louis Dembitz Brandeis lived the life of an enlightened, activist-intellectual. The Mt. Vernon Street and Otis Place homes should serve as reminders of that life. Brandeis purchased 114 Mt. Vernon Street in 1890, just prior to his marriage to Alice Goldmark. He and his wife lived there for ten years. In 1900, they moved with their daughters to 6 Otis Place, where they lived until 1916. Both locations offered urban stability, Charles Riverside tranquility, and convenience to downtown Boston. Most often, the Brandeis family, spent the Winter months in their Boston residences. After Louis' appointment in 1916 as a Justice of the US Supreme Court, the Brandeis Winter home relocated to Washington, DC. 114 Mt. 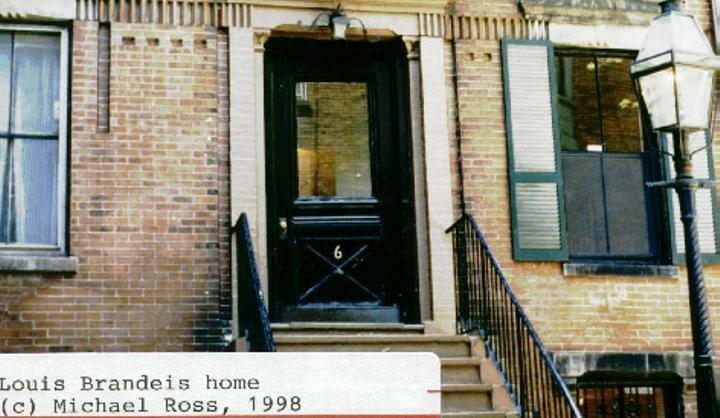 Vernon Street and 6 Otis Place served as a social venue for Brandeis' friends. At both these locations, Louis and Alice socialized with some of their immediate neighbors as well as with visitors from around the world. In these homes, Louis and Alice, also, raised their two daughters, Susan and Elizabeth. The Brandeis family was close-knit and devoted to education. Susan, later, became a lawyer and Elizabeth became an economist. Brandeis, in his prime advocacy years, his fifties and sixties, was both a local and national voice for democracy, morality, and moderate/healthy living. His advocacy was not by words alone, but also by his legal counsel to defendants and plaintiffs, his advise to incoming US President Woodrow Wilson, and his daily, long, urban walks. Jewish culture and Jewish nationalism were vital for Jewish identity. Lina and Jacob Hecht (of Hecht House fame): The Hechts were two Boston Jewish leaders, whose evolving commitment to assisting Jews, literally, catalyzed Brandeis' meteoric rise. At the request of Brandeis' uncle, Lewis Dembitz, the Hecht's assured Harvard University that Brandeis' law school tuition would be paid. But the Hecht's did a lot more than that to advance Brandeis. Lina introduced him at her Sunday afternoon teas to other up-an-coming Jewish Bostonians. Jacob introduced him to Jewish small businessmen. Many of Brandeis' legal clientele stemmed from the Hecht introductions. Samuel Warren and Elizabeth Glendower Evans: Two members of established Brahmin families whose proper upbringings and connections served to stabilize Brandeis in Boston. Warren's formation with Brandeis of a law firm which continues today provided the opportunities for financial success. Evan's formation with Brandeis of a friendship which permeated both their lives provided opportunities for interaction with some of the best thinkers of the day. The Irish labor leader, Mary Kenny O'Sullivan, a variety of Jewish labor union leaders, and the Progressive US Senator from Wisconsin Robert M. LaFollette. Each of these persons inspired Brandeis to stretch his interests, talents, and advocacy in behalf of working people. E.A. Filene: He was a longtime friend, a client, and Jewish (albeit, a self-declared, agnostic Jew). Filene's similar thinking, writing and action on social issues of the day, most likely, spurred Brandeis' ideas and advocacy on such issues as public transportation and industrial democracy. Filene would move to nearby 12 Otis Place a few years after Brandeis moved to Washington, DC. Frederika Brandeis - Louis' mother, and Lewis Dembitz - Louis' very religious, lawyer, uncle - whose teachings made Brandeis open to change and growth. His mother's commitment to the ethics of Judaism, and his uncle's commitment to Shabbos and politics - each served as part of Brandeis' strong emotional and intellectual foundation. Felix Frankfurter: He was Brandeis' pupil and, later, equal artisan of law and politics. It was through Felix Frankfurter that Brandeis envisioned and proposed, federal legislation reflecting his Progressive thinking. Jacob de Haas: The first Editor of the Jewish Advocate - he was one of Brandeis' mentors into the Jewish world of Zionism. De Haas contributed to encouraging and promoting Brandeis' involvement in Zionist politics. One of many books commemorating Louis D. Brandeis' life is "Brandeis of Boston" by Allon Gal, Harvard University Press, Cambridge MA, 1980.
about our shared human shenanigans? YOU CAN TAKE AN ACTUAL DISCOVERY WALK UTILIZING OUR GUIDEBOOK, WHICH YOU CAN PURCHASE BY CLICKING HERE! We've walked what little remains of the once thriving West, North, and South Ends' Jewish communities of Boston. Even today, with little of them standing, the few surviving sites make for a fascinating walking or bicycling tour. Click here on BostonWalks' The Jewish Friendship Trail Guidebook to initiate your own walk tour! Copyright © Michael Alan Ross, 1999-2015. All Rights Reserved. Click here to connect with more of Boston's Historic Ethnic Sites!